I am always looking for ways to expand what Jana will try when it comes to food, and in all honestly she has come a very long way since we met. I have found that the trick is to combine ingredients/dishes that she loves with ingredients/dishes that she might be a little reluctant to try. Steamed Clams is a dish that she really has no desire to eat (a texture thing as it is for most people) So I decided to add some delicious Pork Meatballs to the mix (everyone loves meatballs) and see if this was enough to bribe her to dig into a beautiful bowl of Manilla Clams. Well yes it was enough for her to try but in the end the meatballs and grilled Country Levain disappeared much faster out of her bowl than the clams. I did find myself wondering if this was such a bad thing as I did end up with to large bowls of steamed clams for myself 🙂 (maybe deep down that is what I was hoping for?). I picked 2 fantastic beers to pair with this dish the 1st beer being Magic Hat #9, I was very excited about this pairing as it is one of my favorite beers and at $3.99 for a 22oz bottle you cant beat it. TRY THIS BEER. For the 2nd beer I picked a beer I had not yet tried The Lost Abbey’s Avant Garde, and this was a perfect match, I found myself wanting more (could have been that it was my second bottle and I was in a very happy place) and at $8.99 for 750ml bottle, worth every penny. Yes Beer & Clams should be a classic combination if it is not considered one yet!! Jana is not much of a beer drinker so I picked up one of her favorite go to sparklings, LaMarca Prosecco D.O.C Prosecco is made from the white grape, Glera. This expressive grape is prized for its delicate flavors and aromatics, and this creates a very nice combination with most shellfish dishes. Sells for $14.99. Our resident Wine Expert Amy Payne is still in London finishing up her externship at Decanter Magazine but stay tuned for her pairings to return very soon. Form meatballs about 1 oz in weight. Once the meatballs are about 3/4 cooked remove from the pan and put aside. Using the same pan (you want to keep all the amazing flavor left over from the meatballs) add the leeks, shallot, fennel and fennel seeds. Cook for about 2 mins on medium heat. Cook until all the clams have opened. Remove Clams from pan, leaving the liquid behind. Add meatballs to liquid and finish with butter, parsley and fennel fronds check for seasoning. 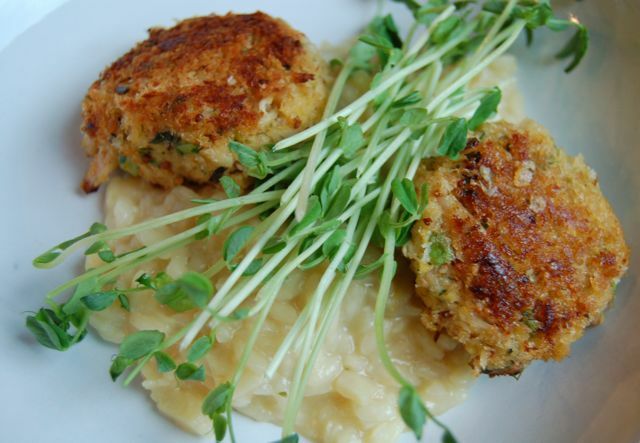 Serve with Grilled Bread and a glass of your favorite wine or beer. 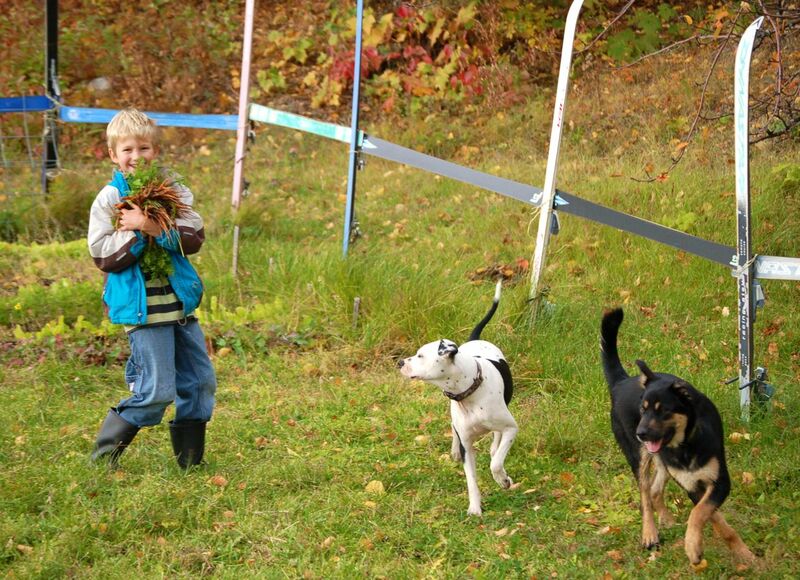 Is there anything better than having as much time as you like to do something you enjoy? I was up early to attend a couple of meetings downtown and on my way back home I decided to swing by Siesel’s Old Fashion Meats to pick up some Pork Shoulder, Belly, Hog Casings and a few other treats to spend a rainy afternoon cooking at home. There is not to many rainy days in SD so I thought I would take advantage of the chilly wet weather and prepare Homemade Sausage with Braised Purple Cabbage. A few months ago I purchased the grinding and stuffing attachments for my Kitchen Aid and have been excited about trying it out ever since. All in all the attachments work well. I would give the grinding attachment a 9/10 and the stuffing attachment a 6/10. The stuffing attachment should come with something to push the ground meat down the hole, this would help the process a great deal. There was a time not to long ago when North America was not considered a culinary destination (and I think the Europeans would still argue the fact that we are not as great of cooks or diners) but times have changed and North America is going where Europe used to be. Butcher shops in Europe are closing but in North America they are on the rise. Places like The Butcher & Larder in Chicago, Lindy & Grundy in LA, 4505 Meats in San Francisco to name a few are becoming celebrities in their own right. Not only can you buy incredible meat at these spots but all of them offer cooking/butchery classes, how great is that? Restaurants specializing in sausage are also making great progress such as Wurstkuche in LA, Hot Dougs in Chicago, even the up and coming food city San Diego has a sausage themed restaurant The Linkery. Yes it is a great time to be living in North America. Butchery, Sausage making and Charcuterie are all arts that when done well can be life changing for someone eating the finished product. So get to know your local butcher, sign up for a class ask plenty of questions and hopefully you will have as much fun as we chefs have creating these delicious links…..
Place a saute pan on medium heat with a splash of oil, add onion and garlic and cook for about 3 minutes, do not brown. Add the herbs and remove from heat. In a large bowl add the cubes of shoulder, belly, and salt, place in fridge for about 3 hours until completely cold. Once meat is ground fold in red wine and then onion, garlic and herb mixture finish with nutmeg. In a sauce pan add vinegar, sugar, jelly and bring to a boil to melt jelly. Add mixture to cabbage and cook covered until liquid is almost gone. I like to finish my cabbage with a spoonful or 2 of cold butter, makes a nice sauce to coat the cabbage. I said this to one of my nephews this week and he looked at me with the face that said, “Oh Auntie Kar….”. Jason and I had great intentions of posting delicious holiday cookies and New Year’s party bites, however cooking, family and fun conspired to monopolize our time. For Christmas Day dinner, my sister and I cooked the best organic chickens from my friend’s farm; a farm that doubles as a recovery centre. Roasted brussels sprouts, southern sweet potatoes, maple glazed carrots and a simple stuffing completed our meal. We had piles of homemade cookies and bars and boxes of chocolates to get through. 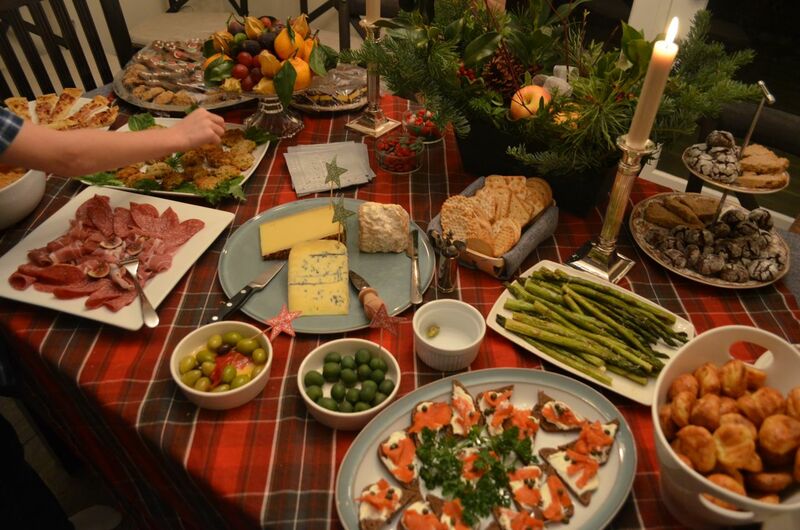 I also hosted five other holiday parties and meals for which I cooked and baked everything from scratch and by January 2nd I was totally exhausted. Via skype, my brother showed off the 15lb prime rib he was cooking for the parents, along with a magnum of champagne. We all giggled as Jason tweeted a live feed of his wife baking macarons – especially when she yelled, “Steward!” from their kitchen. The macarons were utterly picture perfect by the way! We are both settling into new projects this year and we’re getting ready to bring you new ideas, tips and tricks – once again bringing Michelin Star cooking home. A new set of knives and a digital, red kitchen scale were my favourite gifts. 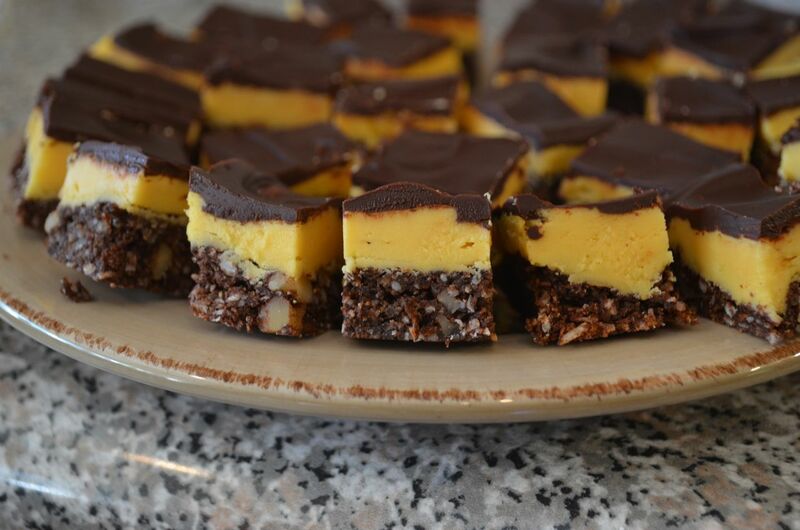 I know it’s a bit late, but if you make a pan or two of these Nanaimo Bars now…..you don’t have to share them! This makes 2 pans (why would you settle for just one pan?). Butter 2 9-inch square metal cake pans. Pre-heat oven to 350. Mix together graham crumbs, coconut, walnuts, cocoa powder and sugar. Add melted butter and eggs and stir until combined. Divide the crumb mixture evenly and press into the prepared pans. Bake for approximately 10 minutes. Set aside and let cool completely. 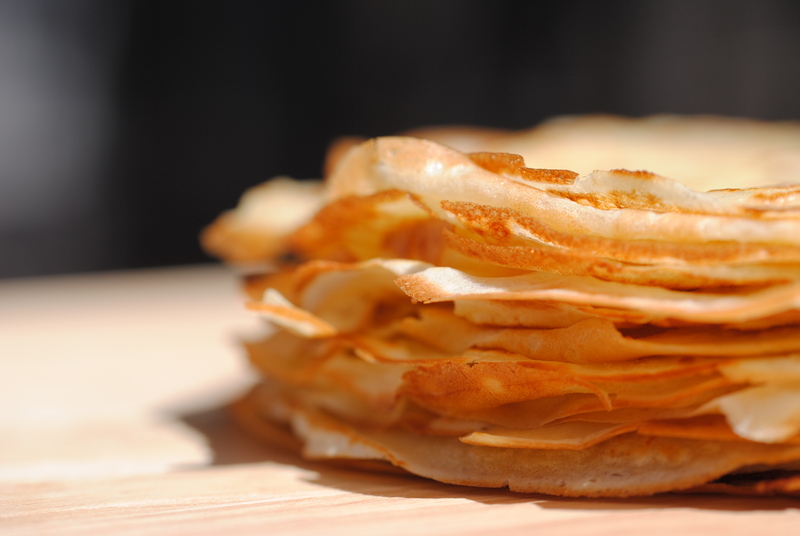 Use your mixer for this if you have one – the custard filling will be lighter and fluffier. Beat together butter, custard powder and vanilla until fairly smooth. 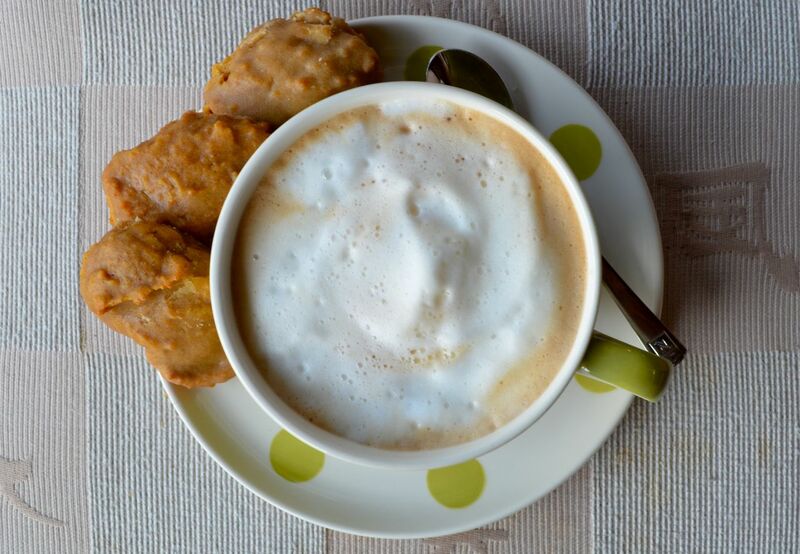 Beat in one cup of icing sugar followed by a tablespoon of milk. Alternate until smooth, adding a little more milk if too thick to spread. The filling should be pale yellow and fluffy. Spread over cooled base; refrigerate until firm, about 1 hour. Use a double boiler or the microwave to melt your chocolate and butter. If I am really honest, I sometimes just melt the chocolate in one of my All-Clad pots, directly over the heat. Make sure the chocolate is smooth and shiny. Immediately spread over filling and refrigerate until almost set, about 30 minutes. It’s best to cut them when cold. You’ll probably eat too many, it’s just the way it is. Coming up! Valentine’s Day Help for the guys and Jana’s famous Macarons! Posed with the query, “what to do with quince”, I called my brother who admitted he wasn’t terribly experienced with this fruit. Jason suggested I consult the web, do a little research on quince butter in particular. Quince butter does indeed exist and seems to be the easiest and most common use; simply boil your quince with sugar for quite awhile, press through a sieve and you’re left with a spread the consistency of applesauce. I, however, was dreaming of pretty pink jelly. Without luck, I tried to find an old cookbook sent to me by an Auntie in the UK – I knew there was a quince jelly recipe to be had in it. Quince is naturally high in pectin, making it perfect for jellies and jams. 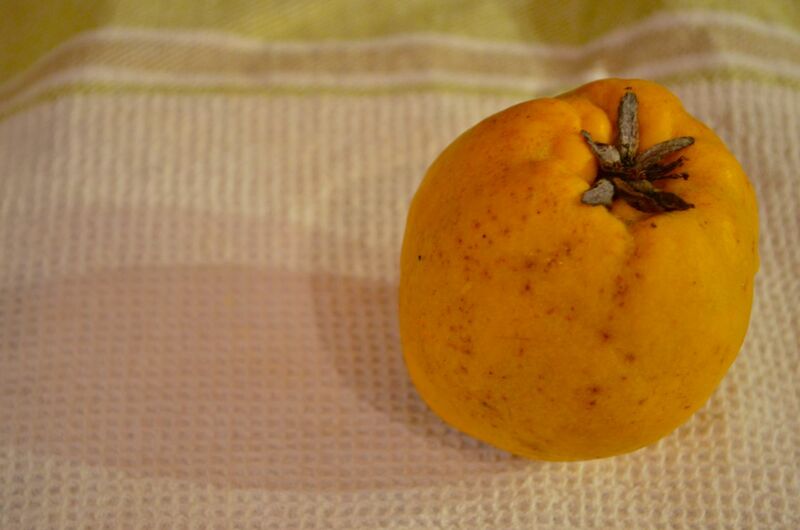 Once cooked, this pale yellow fruit turns an orange-red and its tart, chalky taste sweetens. The scent of not quite an apple, not quite a pear and a dose of perfume started to emerge from the fruit after a day of resting on my countertop. 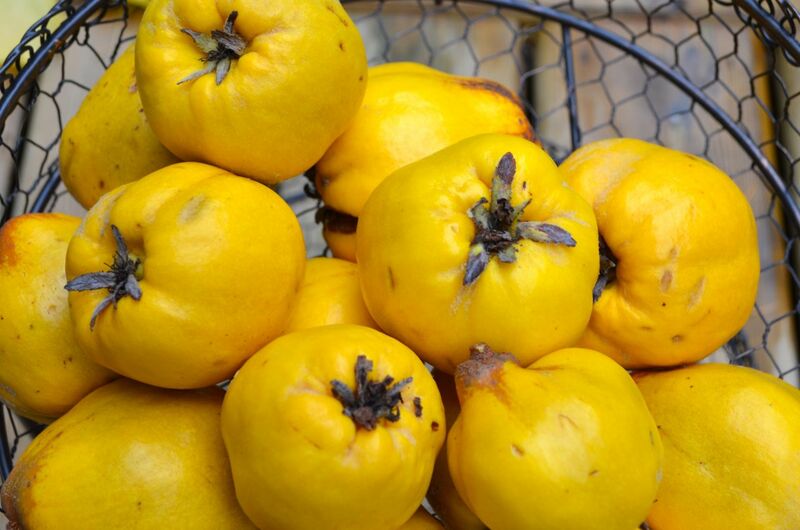 Blog posts and recipes addressed the quince’s intoxicating scent and its ancient mystery. Pairing suggestions ranged from sweet to savory; pork, lamb and cheese were the most common. 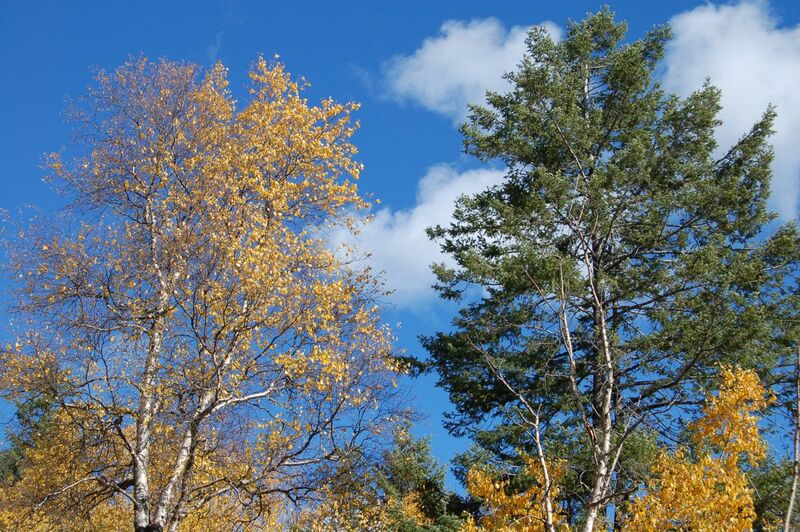 Other cooking methods included poaching with maple syrup or used as the base for a spicy chutney. With a rich history including possible references in the Bible, ancient Greek weddings and Roman cookbooks, I am suddenly in love with this uncommon fruit. The pink jelly of my dreams materialized and we ate it with a hard cheddar. My daughter requested clotted cream and scones, for which I went knocking on Chef Thierry Delourneaux’s door. He graciously obliged with this recipe for perfect scones that would make my British in-laws proud. Thank you so very much Chef! You can read about Chef Thierry’s stunning Rhubarb Dessert here. Simply boil the quartered quince (seeds, skin and all) until it’s very tender, mashing it as it cooks. You will have a put of mushy quince and out of the mouth of babes, my kid said it looked “kind of awful”. 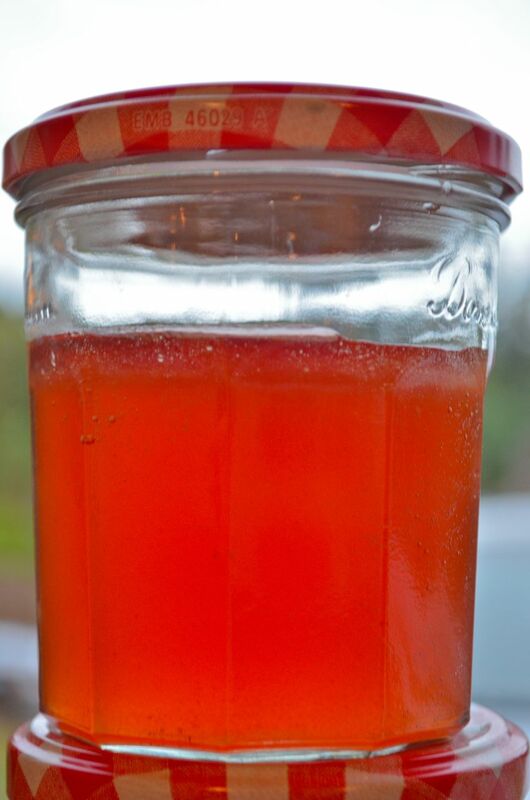 Using a jelly bag, cheese cloth or a fine sieve you let the juice drip out of the pulp overnight. Finally, you cook the juice with almost equal parts of sugar (just less than one cup sugar per cup of juice). Bring it to a boil to dissolve the sugar, reduce heat, skimming off the foam periodically. Check for consistency change by placing a bit of jelly on a plate; push it gently with your finger. If it wrinkles, it’s ready. I had just enough for one jar, but if you have a greater quantity be sure to have sterilized jars ready to go for canning. In a pot, steam raisins with 200mls of heavy cream. When ready spread on a sheet pan and let it cool down. Sift all dry ingredients, add zests and mix with the paddle into kitchen aid mixer until well incorporated. Add raisins and to the mixture. DO NOT OVER MIX. Chill dough. Cut to desire size, egg wash and Bake 350F to light brown colour. Throughout my career I have been very fortunate to work with many amazing charities. Most of my participation has been showing up at a scheduled time and cooking a specific dish for a specific amount of guests, occasionally donating myself to be auctioned off to cook a dinner. In May of 2009 I was doing a photo shoot in Chicago for a Magazine that was featuring Canadian Chefs that worked outside of Canada. I was just finishing up when a lady walking her dog approached me and asked if I was a new chef in town. She introduced herself as Linda Novick, Executive Director of Common Threads and began to tell me about the mission of this charity. The minute she told me this was a chef driven charity that works with children to teach them how to cook, eat and shop healthier I knew I wanted to get involved. My very first Common Threads experience was attending a lunch served by the Little Threads. What made this such a special lunch was the kids were cooking for their parents and to see how proud each parent was of their child was life changing. The typical Common Threads child comes from broken and low income homes and to listen to their stories on how learning how to cook has changed their lives was incredible. When speaking to a few of the parents at the lunch there was a common message, each parent spoke about how their child’s confidence had grown and the friendships that were made between the classmates. What made Common Threads special to me was seeing how involved Chefs were in teaching classes and cooking at the fundraisers. These chefs were some of the most talented and successful chefs in the country and had restaurants that were full night after night but they still found time to work with the children. Fast forward a couple of years and living back in Southern California, I learned very quickly that there is much more to creating a successful fundraising event than just showing up and cooking food for a couple of hours and then heading home. We started planning the very 1st LA World Festival in March and we capped it off with the main event on November 8th. A truly amazing night of great food and friends showing that Common Threads will succeed in LA. Not only does Common Threads bring children together to create friendships and bonds that will probably last a life time, it also brings a group of chefs together to form a bond and a friendship that is so very important to the success of our business. A happiest of days to all of our A Michelin and A Mom readers. As you know, the Canadians (me) have already celebrated Thanksgiving way back in October. This year I brined my turkey (my brother insisted) and created a port, butter and shallot glaze that turned the turkey a delicious colour (a deep bordeaux). I kept the sides simple and traditional as I was cooking in my rustic kitchen at our cabin. Our guests and neighbors ate heartily and barely had room for the Caramel Apple Pie. What does a Michelin Star Chef crave on Thanksgiving? A turkey cooked to perfection by his lovely wife (my sister-in-law!). This year, in Southern California, they are hosting her family for tonight’s big dinner after Jason caters a private dinner in the city. Wouldn’t you love a proper chef to come in and make the dinner for you? Stay tuned next week when Chef Jason delivers a full report of the past two weeks working with two charities in L.A. He has been cooking for the stars and in the process helping kids get access to healthy foods and access to arts programs – my daughter really wanted to fly herself to L.A. to help her Uncle Jay! Do you have a special Thanksgiving dish you love to cook? Please share it with us in the comments below. Today is the last day of National Fig Week – so we’re getting this post up just in time! Fresh figs are now scarce “up north”, but I did manage to find a few at Whole Foods and a couple of other fresh produce shops a few weeks ago. Figs are full of fibre, potassium, calcium and antioxidants. 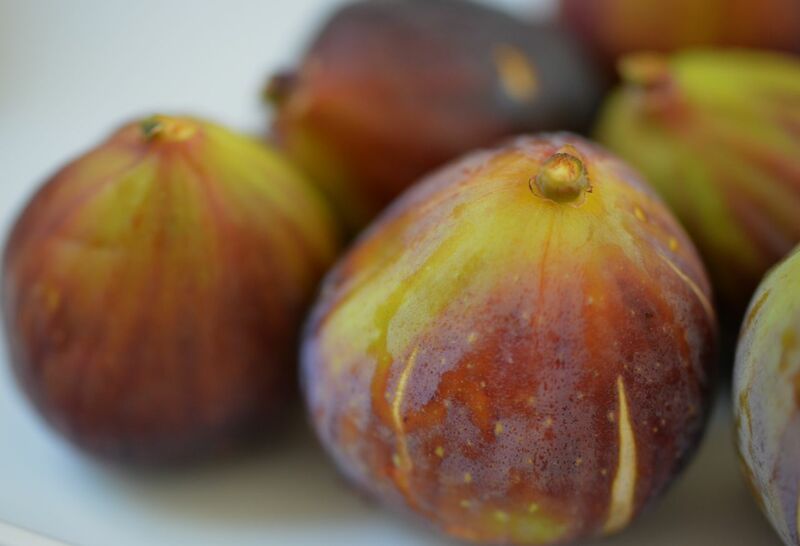 A perfectly ripe fig can be eaten on its own and should be one of the most delicious foods you’ve eaten! This ancient fruit is versatile, lending itself to both sweet and savoury dishes. This summer my daughter requested fig compote to accompany her brie and chicken sandwich, for which we used dried figs. 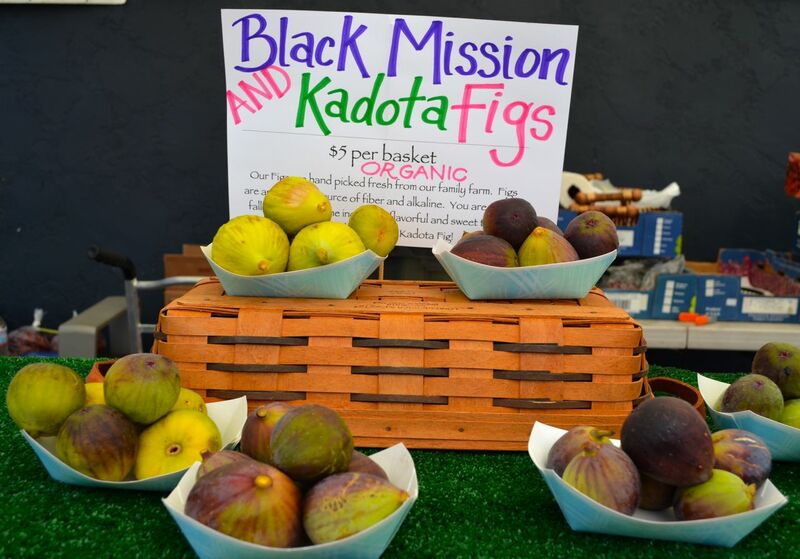 At the end of August, Jason and I found gorgeous fresh figs at a Sunday market just outside of San Diego. Jason cooked crispy duck breast (fuelled again by a request made by my daughter! ), which he simply finished with halved figs. Meanwhile, a friend of mine who is also a faithful reader of A Michelin and A Mom, posted a quick “what to do with a bunch of fresh figs” on our twitter. Jason answered with one word: jam. Following is Rachel’s foray into fig jam! 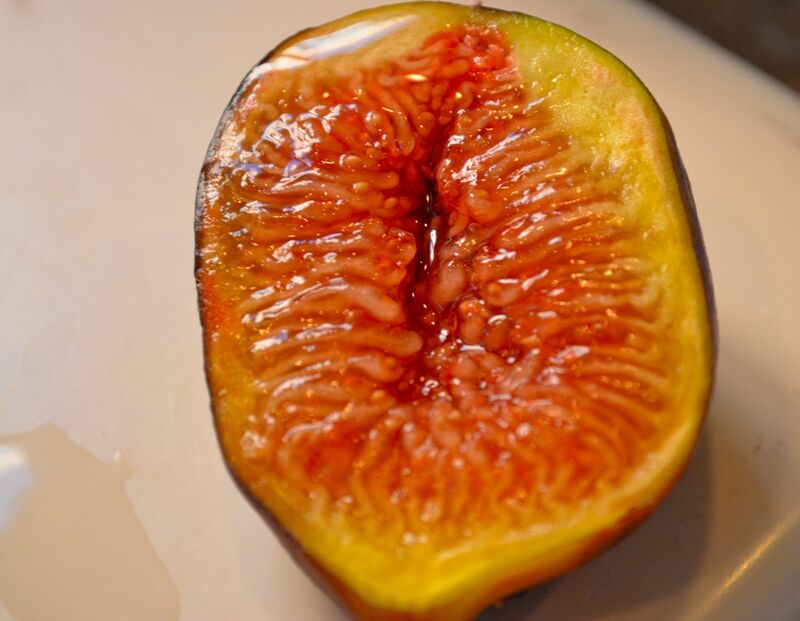 This past August I had my first real encounter with figs; not having given figs much thought nor had many opportunities to try them or cook with them. To think of all the lovely figs I missed out on! I was introduced to figs somewhat by accident when my landlord’s mother asked me if I would like some fresh figs as her neighbour’s tree was heavy with ripe figs. I was soon ladened with about 2lbs of very ripe figs. I knew I would not be able to eat them all before they were past their prime, so I took to twitter and requested help from Karlin and Jason. I took up Chef’s suggestion for making a jam, and set to “consult the Oracle” (google) for some further direction. The first thing that jumped out at me when reviewing a few recipes is that making fig jam would be very easy! I was surprised that most recipes called for adding no water (I haven’t made much jam in my life so I’m not sure if this is usually the case with other types of jam). The recipes called for varying amounts of sweetener (sugar or honey) and I went on the conservative side (about 1/2 c. of sugar for my 1.5 lbs of figs) as I knew the fruit had a great deal of natural sugars. I also added some balsamic to give the jam some pizazz. You know, because that’s how I roll. The yield for this batch was 2 to 3 cups (I’m guessing on this) and has been delicious with crackers and cheese, and especially with roast chicken, as recommended by Jason. Thanks again for the inspiration, A Michelin and A Mom! Tomorrow night Jason is proudly part of Common Threads: World Festival Los Angeles. My brother is a member of the Common Threads Advisory Board, which is hosting a fabulous evening to benefit great kids in the L.A. area. The event’s page reads: “At the pristine setting of the London Hotel’s beautiful Hampton Court, guests will be able to stroll around the modern take on an English garden while delighting in mouth-watering bites…” Enjoy the evening and we look forward to a full report from Jason later this week. The Vegetable of Many Faces? 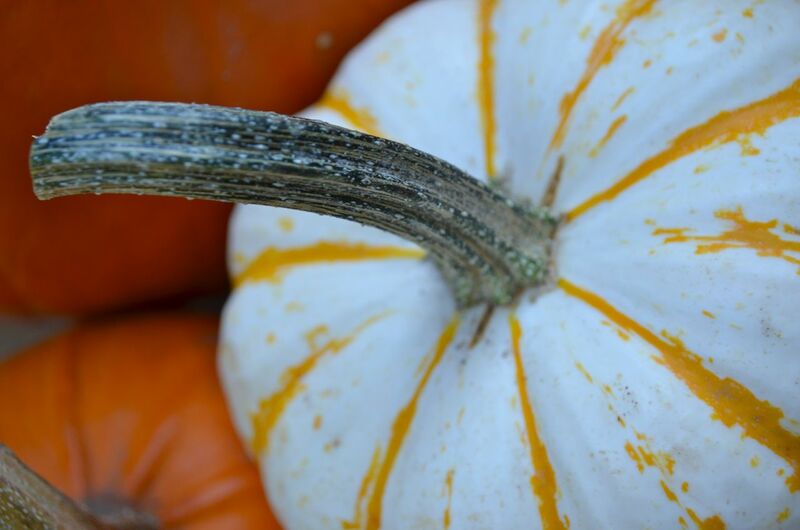 Pumpkins, what a “cool” vegetable and is there a more versatile vegetable? My opinion no there is not, and the pumpkin has been around for a very long time. The oldest evidence, pumpkin-related seeds dating between 7000 and 5500 BC, were found in Mexico. I am not really sure who or why someone decided that pumpkins were going to be the face of Halloween but what a brilliant idea. The pure joy of watching the competition (some more serious then any professional sports championship) and excitement of the pumpkin carving contest is magical. Is there anything a pumpkin can not do? We use pumpkins in just about everything from a latte to flavoring beer, savory to sweet and we even toast the seeds that really are simply delicious. For Chef McLeod’s roasted pumpkin and chilled goat cheese ravioli, I recommend a fuller-bodied white wine or a -lighter bodied red to avoid overwhelming the subtle flavors of the goat cheese. Top Pick: A Chenin Blanc from the Loire Valley, France, such as Savennières. Chenin Blanc has naturally high acidity and an aggressive bitterness which pairs well with warm fall flavors. In its youth, Savennières can be austere, dry and rigid. But as it ages, it develops a complex honeyed undertone with a rich palate. Two Grand Cru appellations within Savennières include La Roche aux Moines and Coulée de Serrant. Typical aromas include bruised red apples, chamomile tea, wasabi, tangerine, chalk, limestone and wet wool. 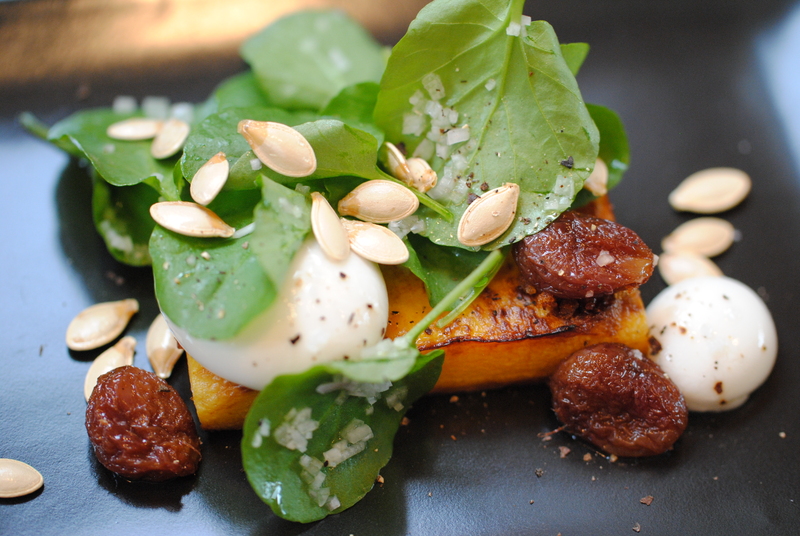 Playing it Safe: A lighter-bodied Gamay from Beaujolais, France, complements the roasted flavors of the pumpkin. Beaujolais has a very distinct flavor profile of banana, bubblegum and pear drop due to its aging process, carbonic maceration. This is when the alcoholic fermentation occurs in whole, uncrushed grapes in an anaerobic environment, under the protective blanket of carbon dioxide. The grapes eventually explode and are crushed under the weight of those above it. Other aromas include strawberries, black cherries, violets, and crushed granite. Off the Beaten Track: Orange wine. Yes, it exists. They are lush and perfect for fall. One of the best producers is Stanko Radikon. Located in the small town of Oslavia in the Isonzo zone of Fruilli, the winery is known for hand-harvesting, extended skin maceration, large, older barrel fermentations without temperature control, no added yeasts or enzymes, and little or no use of sulfur. Kürbis is the German word for Pumpkin. In our early days of living in Switzerland, we ventured across the border into Germany and found a decent Italian restaurant recommended to us by one of our friends. It was totally packed and the staff of family were shouting in Italian to one another across the restaurant. They squeezed us in and our waiter (who became our favourite and always had a table for us) suggested we try the soup. Kürbis. We walked through our limited German not knowing what we had ordered until the creamy soup the colour of pale squash arrived. It clicked for one of my kids who immediately figured it out and said with a smile, “pumpkin soup”! Haven’t you always wanted to try fresh pumpkin? Did it seem daunting and perhaps even a little strange? 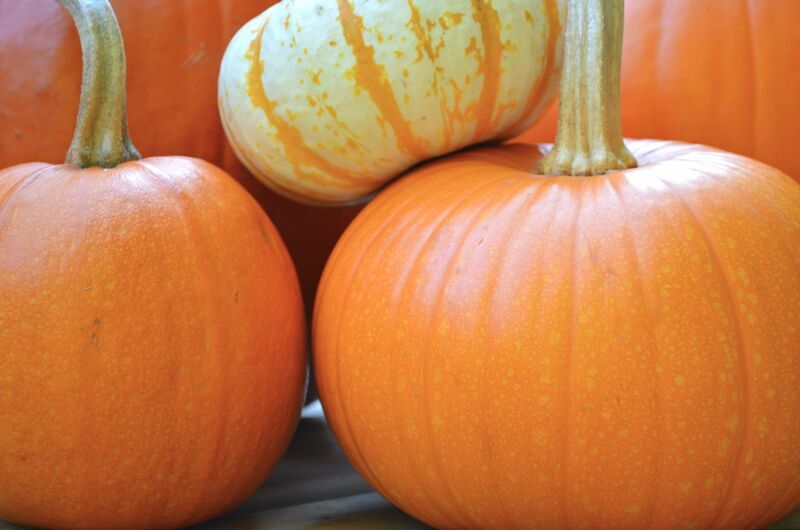 Buying, washing, cutting up and roasting your own pumpkin is so easy, you may never go back to the tins. For both of the recipes featured today, I used Organic Sugar Pumpkins. We were also given a white pumpkin which we cut up, roasted and pureed as well; the puree was a lovely pale colour. Roasted cubes of pumpkin with a little olive oil and salt were happily eaten as we waited for the cubes to cool. Wash the pumpkin well before you cut it. Cut it and clean it out (save the seeds for roasting). Working in small sections, slice off the rind and any leftover pulp. Cut the pumpkin into cubes. Drizzle the cubes with olive oil and sprinkle with kosher salt. Lay cubes out onto a deep baking dish, leaving room between each cube if possible. If you have a convection oven, put it onto “Roast” and pre heat to 400 degrees. 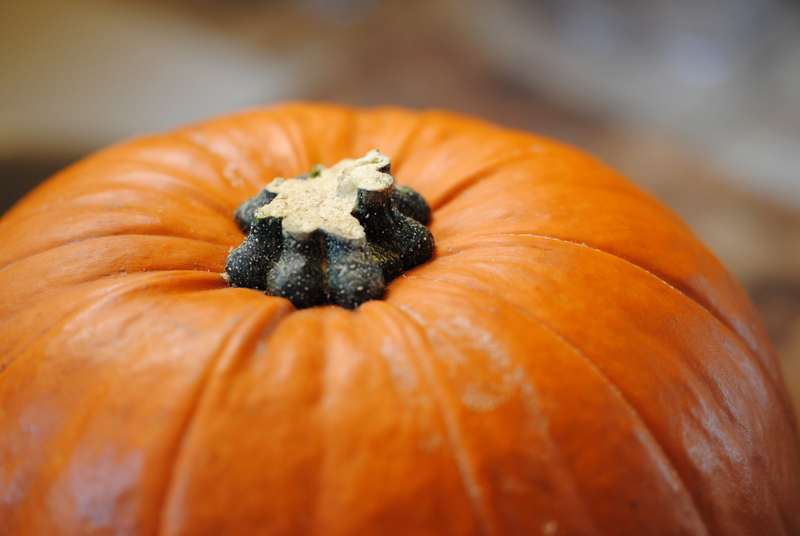 The pumpkin cooks perfectly – tender on the inside, slightly crispy and brown on the outside. 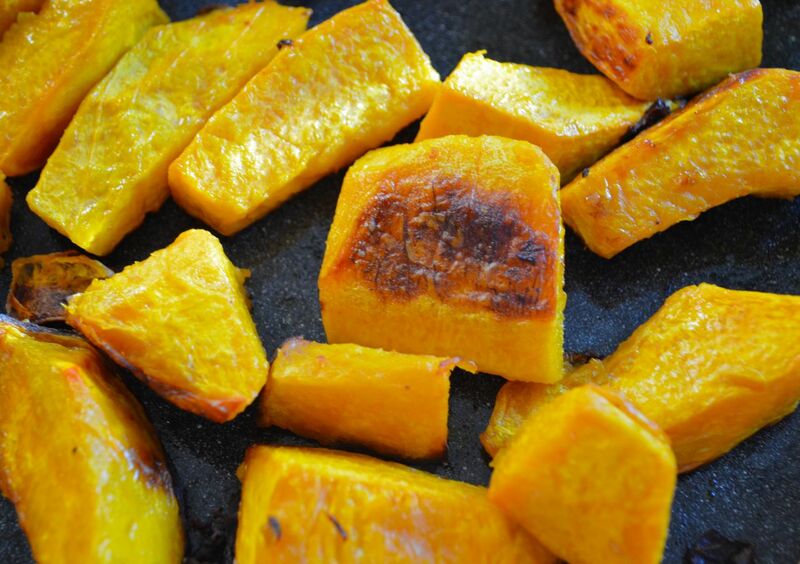 Keep an eye on it – you don’t want burnt pumpkin (about 15-20 minutes). Remove from oven and set aside. In a deep saute pan or your soup pot, melt the butter on medium-high heat – do not brown the butter. Add leeks, shallots and pinch of salt. 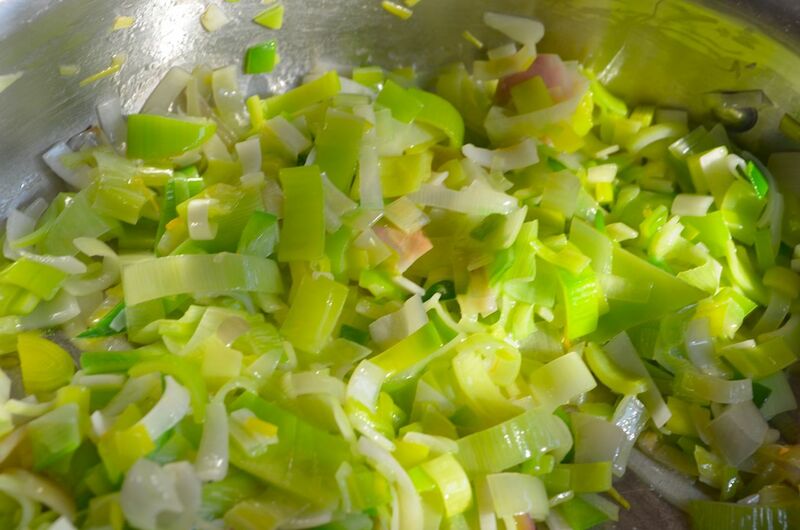 Cook for quite awhile – you want the leeks tender and bright green; you will be “sweating” the leeks and shallots, stirring often. Add the cubes of pumpkin when leeks are tender and cover with all of the stock. Stir and bring to a boil for a few minutes. Remove from heat and let cool slightly. 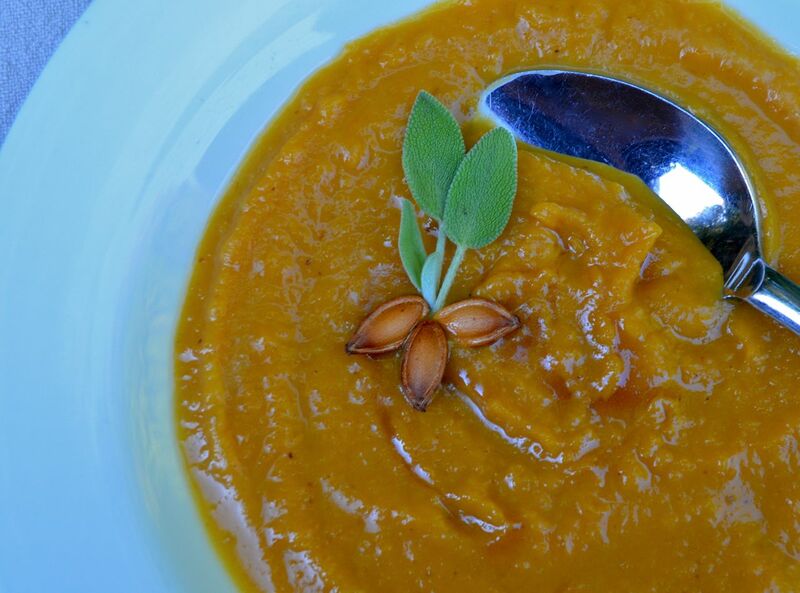 You can use a hand blender to blend the soup or s traditional blender (work is small amounts to puree). Return all the pureed soup to your pot and heat on medium. This is when I added a little milk – the soup was too thick for our taste – use your judgement at this stage and adjust to your taste. Also, add salt as needed or desired. 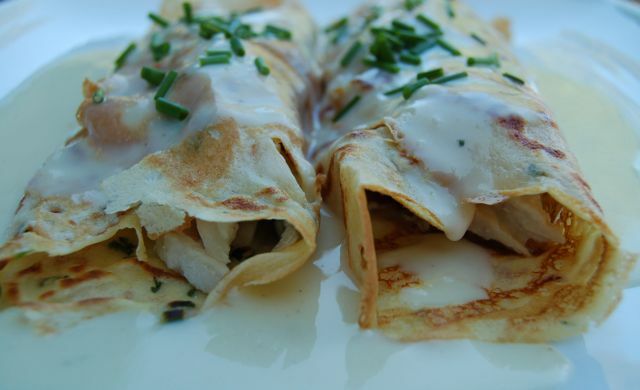 ** A little dollop of Creme Fraiche is a wonderful addition. ** Toasted pumpkin seeds sprinkled in each bowl creates an interesting texture. ** To really impress, top the soup with Brown Butter or Beurre Noisette (also used in the Madelines) and Sage. Once the butter has browned, add the fresh sage leaves to soften. Drizzle just a few drops over each bowl of soup and add a sage leaf to each bowl as well. Pre heat oven to 325 degrees. Sift and set aside dry ingredients. Beat together butter, and sugar until creamy. Add pumpkin, egg, and vanilla (the mixture may look curdled, but smooths out when you start to add flour). Gradually add dry ingredients to butter mixture until blended – do not over mix. 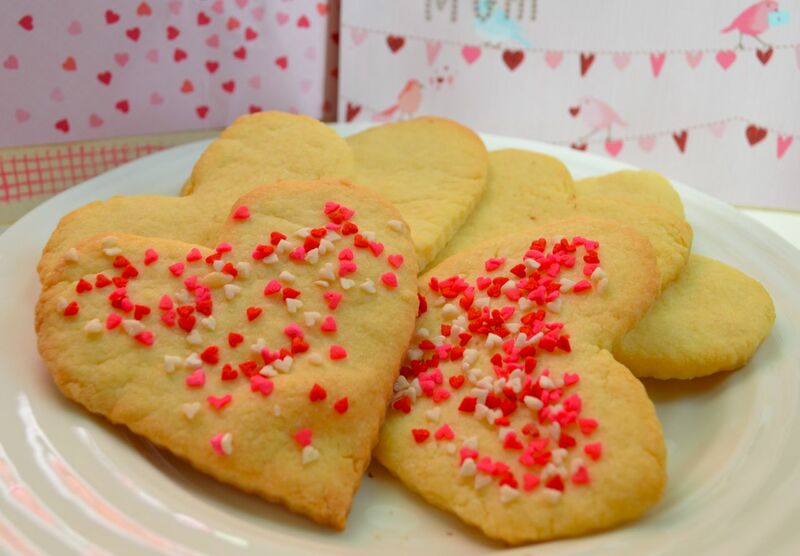 Drop by teaspoonful onto parchment lined cookie sheet. Bake for 12-15 minutes – test for doneness by lightly touching the top of the cookie; it should spring back. To make the glaze, combine brown sugar with milk and butter in a small/med saucepan and heat until it comes to a boil. Allow to boil for one minute, remove from heat and add maple and vanilla extracts. Add the sifted icing sugar 1/4 cup at a time, whisking well after each addition. The glaze should be smooth but not so thick it is spreadable. Whisk until smooth. Dip the cooled cookies (dip the tops or half of each cookie) into the glaze and set on a cookie sheet/parchment to dry. The glaze should be warm for best results. Eat the cookies while they are still warm (a little messy but so good) or cool for several hours if you prefer the glaze to be set.